Since I already made a post about my favourite levelling method for very lazy days (that’s also a good method for getting interesting or fun items), I thought I should as well make a post about what exactly I’m wearing in the pictures there, even though this one is probably not complicated to figure out. Anyway! Blue Overalls: The basic item of this look, pretty much useful for everything that’s more grounded and work related like a farmer, miner or fisherman, and I even read about someone going for the look of a plumber. Also rather easy to obtain, every tailor with a skill of at least 100 can learn the pattern that is sold in several places on both alliance and horde cities! Yellow or Orange Martial Shirt: Simple and effective for completing the look and adding more colour, but can be easily replaced by any other kind of shirt. Examples are the different Martial Shirts (a blue one makes the Overalls look more covering), a Lumberjack Shirt for a more heavy work related look, a white shirt of any kind for less contrast and an overall simpler outfit, or something like the Pink Mageweave Shirt to add some fabulousness. Crochet Hat: In my opinion, there has to be a hat! This one is rather easy to get because it’s a grey drop from various mobs in the level 40-50 range. 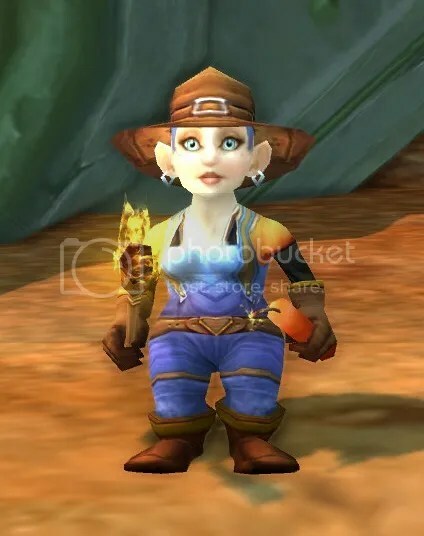 The Hat can be also left out for showing the hairstyle, or replaced with a different hat of any shape and colour, especially if there’s one needed with a better quality for Transmogrification. If I feel like being colourful and have a shirt in a matching colour, I like to use the Crimson Felt Hat sometimes. Archmage Gloves and Archmage Slippers: I like to use items from the same sets for the hands and feet if they match well, because it’s a good way to round up an outfit, like I already did with the Battlemage one. I simply chose these because they fit the hat well, for people who can wear leather there should be a whole lot of different possibilities to work with the chest armor. Willow Belt: Just an item I had flying around in my inventory from earlier levels, I kept it and now used it because the colour matches the other brown and simple items. Spider Frier: For exploring caves and other dark places, there needs to be some light – and a lantern is nowhere near as effective for fighting off spiders and other monstrous beasts (like moths or even bats!) that might lurk around in these locations! This item is a reward from a quest in the Western Plaguelands. Thermotastic Egg Timer: Just in case of emergency or a blocked way… No one plans to use it, but if you need it it’s great to have one at hand! This one is another reward, this time from saving the robot chicken in Tanaris. 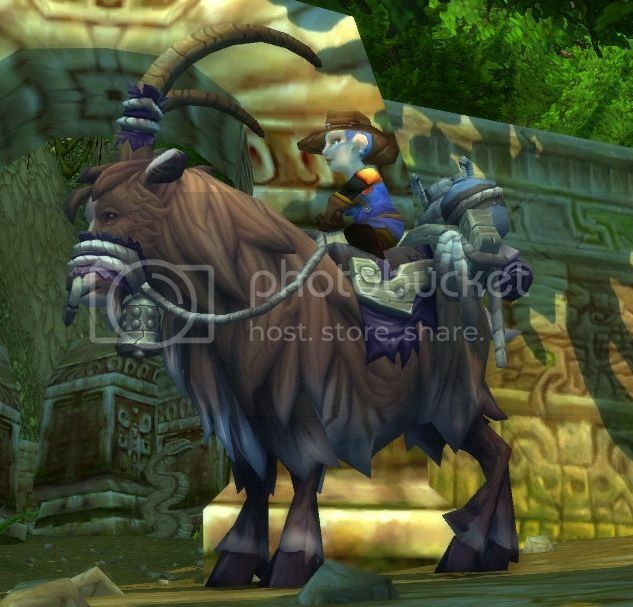 And I forgot to mention – the Brown Riding Goat is actually part of this set as well, at least I always took it as a given that one little Gnome couldn’t possibly carry all that stuff around she might need for investigating digsites, and then eventually taking any findings back home. Also, since I’m done already and this really wasn’t that interesting, here’s a little extra: a fitting music video related to WoW, the profession and artifact-hunting, basically a little background song to Harrison Jones, the Archaeology Trainer in Stormwind. This entry was posted on Sunday, August 11th, 2013 at 14:20	and tagged with Archaeology, Roleplay, world of warcraft, WoW and posted in Armor Sets, Professions, World of Warcraft. You can follow any responses to this entry through the RSS 2.0 feed.